Weightlifting shoes are made specifically for squatting, clean and jerk and other powerlifting and Olympic weightlifting. The feature a hard, thin sole. This is super important for weight lifting as it allows your legs to push off directly against the ground. If you attempt to weightlift in padded running shoes, like many Nike shoes, a lot of the force your body is exerting is absorbed by the padding. This slows down your progress and actually makes it harder to lift as much. The solution is to lift in shoes that have a hard sole which will transfer the force directly from your legs to the ground, without absorbing or reducing that force. This is why you may see some people lifting barefoot. When lifting barefoot, the force from your feet goes straight into the ground. Along with barefoot lifting, a lot of people will weightlift in minimal running shoes or Chuck Taylors. These shoes are good in that they do have minimal sole padding. I actually lifted in Chuck Taylors for years before getting a real pair of Olympic weightlifting shoes. While these alternatives work great, a pair of true weightlifting shoes is incomparable. Along with the hard sole, weightlifting shoes also have a raised heel. The raised heel of weightlifting shoes specifically helps with lifts like squats, snatches, and cleans. The raised heel improves ankle mobility allowing for a more full range of motion. The grip of weightlifting shoes is also stronger than many alternatives. The last thing you want it for your feet to start sliding or your feet to start rolling while you are lifting a heavy weight. This is dangerous and will hinder your lifts. Finally, a proper pair of weightlifting shoes is going to have extra tight support, making sure that the shoes do not slip off or get loose in the middle of a lift. Many shoes have laces along with Velcro strips that provide extra tightness. A good pair of weightlifting shoes will allow you to lift more weight and will help you keep your form correct. Having a correct form when lifting is key to avoiding injury.If you want to lift safer and stronger, get a paid of good lifting shoes. Along with function, you probably want to look good in the gym. We’ve all seen the guys with toe shoes doing their thing. The shoes might work for them, but you have to admit, they look pretty geeky. It’s not hard to find a good looking pair of weightlifting shoes. Good looking shoes can help increase your confidence at the gym. If you are a bodybuilder, you care about what your body looks like. It only makes sense to care what your shoes look like. Here are six of the best looking weightlifting shoes. Each of these shoes is a solid weightlifting shoe. These shoes are weightlifting shoes first, and good looking second. 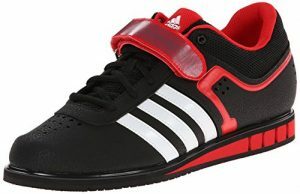 These are a great paid of Adidas weightlifting shoes. 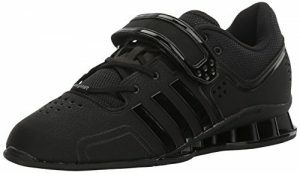 Adidas is the second largest shoe company in the world and is probably the best shoe company when it comes to weightlifting shoes. The heel is rubber, the shoe is snug and has really great anti-slip technology. It has a weightlifting-specific design meant to support super heavy loads without any problem. The top strap provides a secure hold on your foot. If you want to do Olypic weightlifting, these shoes cannot be beat. The sizing is similar to other Adidas shoes. Finally, the look of these shoes is low key, classic Adidas. You can get the all black version, which will make the shoes less noticeable, and they will go with just about everything. I personally like the white shoes with the classic triple Adidas stripe. They remind me of the Adidas soccer shoes that all the kids would love when I was a child. This is a great looking, high quality shoe. They are like a classic business suit; not flashy or extravagant, but they look great and do their job well. These shoes offer a wide, solid base and a high-density midsole. They have a mesh top which allows your feet to breath well. These are great for anyone who sweats a lot or whose feet get too warm when working out. They have a raised heel, making them especially great for squats and other lifts that need a lot of ankle mobility. With these shoes your feet stay glued to the ground and you can focus on the lifting instead of worrying about your shoes slipping or your feet rolling. These shows are a bit louder than the Adipower shoes listed above. They come in at least three colors. They include a really cool “retro” feeling red while and blue color scheme that I really like. Those are not for everyone, but if you can pull them off, you will look like someone from the American Olympic team circa 1984. Again, you have the classic Adidas triple stripe, but a bit more color. This is a great pair of weightlifting shoes for anyone who likes lifting in Converse Chuck Taylor’s. They are hightop shoes, though low top options are also available. A lot of people who switch from high top Chuck Taylors to low top weightlifting shoes experience a feeling that their ankles are not being fully supported. This feeling is avoided when your weightlifting shoes are also high tops. These Reeboks were designed by famed powerlifter Mark Bell. The shoes are stable and have an extra large toe area so that you can spread your toes out comfortably for better grip. They are great for all powerlifting moves, including the deadlift. They look fairly low key. 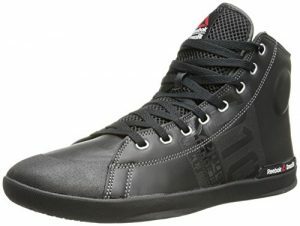 They are high tops, similar to Chuck Taylors in terms of cut, but are all black and less discreet. They are a great looking pair of hightop shoes that also happen to be designed by a well known powerlifter. The Romaleos are Nike’s main weightlifting shoes. They are quality weightlifting shoes and offer good stability and a tight fit. These are great shoes, but they are a bit more expensive than the other shoes on this list. 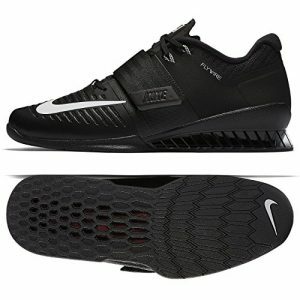 Honestly, Nike does not have as big of a footprint in the weightlifting shoe market as does Adidas. However, Nike is the worlds largest shoe company, and they do a fine job at competing with Adidas and others with their Romaleos brand. I would recommend this shoe for anyone who specifically wants a pair of Nikes. Nikes are recognized, loved and respected by people around the world, and owning a pair of Nike weightlifting shoes certainly won’t harm your fashion reputation. I think the Romaleos have two good looking color schemes. The first is the black shoe with white swoosh pictured above. Black shoes look good and go with everything. My second choice would be the white shoe with a black swoosh. It’s a simple look that clearly shows off the Nike logo. They also have some louder colored shoes, including bright yellow. Should You Wear Weightlifting Shoes Outside The Gym? A good looking and well made pair of weightlifting shoes will go far in making you look good in the gym. Not only are the above listed shoes stylish, they will help you lift heavier weights and will help keep your lifting form perfect. Heavy weights and good form are even more impressive than a good looking pair of shoes. However, weightlifting shoes are not too practical outside of the gym. The hard soles and not comfortable for running or even walking. I would not want to spend all day on my feet on my weightlifting shoes. Also, weightlifting shoes are not cheap. If you only use the shoes in a gym, then they will last many years. If you walk around in the shoes everywhere, they will wear out much faster. For me, I would have no problem wearing my weightlifting shoes when stopping at a store on my way home from the gym. But if I am going out somewhere for a longer period of time, I will wear something other than my gym shoes.